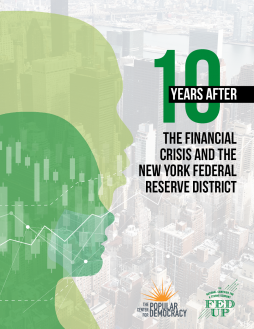 This report marks the 10-year anniversary of the global financial crisis that threatened the stability of the financial system and resulted in severe and protracted economic hardship for communities across the United States. In the ten years since the crash, many of the financial institutions at the center of the crisis have grown bigger and more profitable than ever. This stands in stark contrast to the reality of millions of working people who have still not recovered. The 2008 financial crisis highlighted the failure of U.S. regulatory bodies, in particular the New York Federal Reserve Bank, to identify systemic risks to the financial system and to properly supervise Wall Street banks. The Federal Reserve’s unprecedented use of emergency lending to bail out failing Wall Street banks raised serious concerns about transparency and pervasive conflicts of interest among the Federal Reserve Regional Banks. Indeed, eighteen former and current members of the Boards of Federal Reserve Banks are affiliated with banks and companies that received a combined $4 trillion in emergency low-interest loans from the Federal Reserve during the financial crisis. New York Federal Reserve Bank leadership, made up of executives from regulated banks and companies, pursued interventions in 2008 that dramatically benefited the very institutions they were charged with regulating. At the time, regular Americans were left behind and, ten years later, continue to face economic hardship. While unemployment levels have shown solid progress as a result of the Federal Reserve’s low interest rate monetary policies—prompting Federal Reserve leadership to argue the economy has reached or is approaching full employment—this report reveals that by critical indicators American families are still struggling. In 2018 the New York Federal Reserve is appointing a new President. Given the New York Reserve Bank’s location in the financial capital of the U.S., it oversees the largest and most profitable Wall Street banks. With this critical appointment, the Federal Reserve has the choice to repeat history by selecting another financial industry insider, or chart a new path by selecting a new President who will put the interests of the public before Wall Street. In 2018, the New York Fed can make history by appointing a diverse candidate without ties to the financial sector who will aggressively pursue full employment, regulate financial firms in its district, and fully enforce key provisions of the Dodd-Frank Financial Reform Act intended to identify systemic risks to our financial system and hold banks accountable.